One has been merely seeking to examine as many of the ramifications as possible that may allow for the logical assessment of the claim that has been made about this very incredible saga. Those of you who can walk and chew gum at the same time……..THINK. If some of this story is true, it is obvious that those involved in the “fradulent part of the process” will do everything they can to stop or stymie any progress in finding the truth. Re read Caswell Franklyn’s posts about finding 17 plots and fraud in this matter. There is a breath of fresh air when you throw away the tarnished garb of the partisan , illogical , political operative and don that of the well informed , serious , social commentator . I thank you for your intervention . Hummmmm Mr. Miller may or may not inhabit the Barbados island but like his side kick onions utilizes one of many names to apply posting to these Barbados Underground blogs. In light of evidence presented, they, miller and onion, of course would find reason (s) to doubt plantation deeds or not say anything at all. This is quite visible. Action speaks louder than words. The two, Miller and Onions are definite BLP supporters don’t hide it but flaunt it even in light of fact that Arthur and the BLP train wrecked Barbados. Arthur we know is a drunk; he stutters and his mind is a lot less stalwart. Several Youtube videos proves this. Also Arthur, during a budget debate could not remember that he actually chaired the meetings of Cabinet discussing the VECO matter. He said he wished he was there. But when told by both Minister Sinckler and the Prime Minister – ‘no Owen, you were there,’ he then said that he said something else. When pressed again, he again said something completely different and also said that he never said what he said on the two previous occasions the entire country heard him say it. Either he is a suffer of Alzheimer’s disease, forgot taking his medication, possibly drunk or both. Arthur is now racing for prime minister title, AGAIN. His previous terms of fourteen years yielded more negative than positive – lots of embarrassment. He will just produce more negative – more embarrassments. I suppose if were very sycophantically supportive and blindly partisan follower of the current political administration’s ‘deeds and misdeeds’ I would be deemed the complete opposite to your description above. Thank God I can think for myself with compliments to a sound education partly supported by the State under EWB. On the other hand I appreciate your recognition of my simple contribution to the debate. What I would like to see you do is to dig deeper and see that the there is much more in the simple but entrepreneurial Violet Beckles’ mortar than just a thieving fraudulent set of lawyers’ pestle. One question I would like to pose to you, though. Do you think some of the lawyers that are known members of the BLP are involved in this swindle to dispossess a poor woman of her inheritance? Now let us see how you are going to wrap yourself in the yellowish partisan garb like a logical hack that would make Carson C. Cadogon or ac smile with envy. I am puzzled by the Farm plantation case. If it was “cleaned” up and in production as a “Farm/Agricultural enterprise”. Is Mr.Bjerkham intending to keep The Farm Plantation in production. Will he get a “change of use” approval if he wants it to become “Residential” ? Barbados is a cesspool of complexities. Legalese. 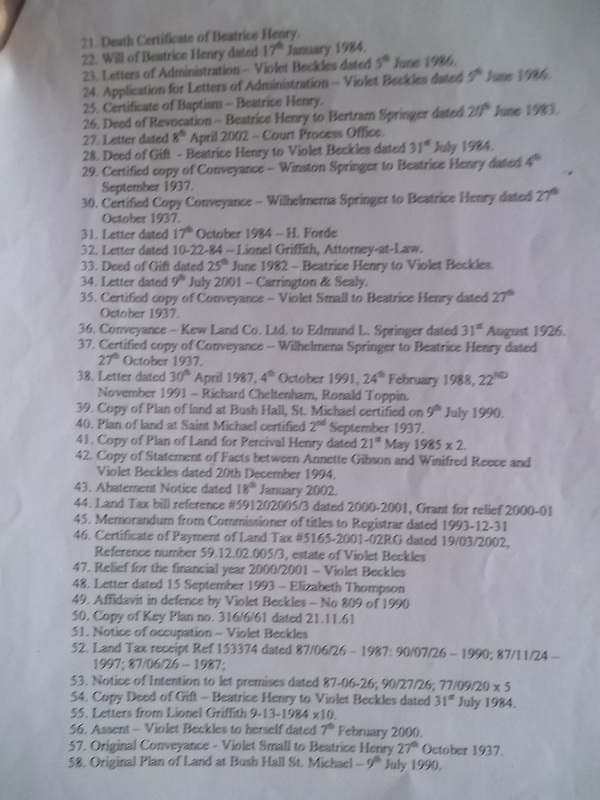 @ remember, The deeds from Beatrice was given to Violet 1984, The deeds were then giving to Sir Cheltenham 1986 . After Sir ham told Violet he can find them ,Violet then paid for a search to be done at the Archives this is how and the only way it come out in or about 1986/1987 , Now today nothing can be found. So we need FOI. to see if the records are there or burned to hide the Fraud , This is Fraud ,unless you want to agree with Richard Byer and said we made them up .Like some said Violet was not a legal person. GO back to the report .The Archives may have put that on the top to show who did the first deeds back them as an up grade for information, Some have it and some dont , It depends on when i was done and who did it at that time, Study the words on the papers , If they are not true then what is , No one of us was alive in 1940 , but the information in the body is to be study. Road maps and books of today can not even give you all the names and the surrounding Plantations abutting and abounding. Boss man Hants, you too smart! This plantation when transferred to the construction magnate is earmarked for ‘concretization’. We shall see if this man known to finance your preferred party electoral campaigns and put money in politicians’ pockets like lashes will get his way like the CLICO boss man. The question is: Do we need food security of more concrete ovens? You can bet that this man’s election campaign money will make the mare fly next time around. Just remember when you dine at the devil’s table there is an eternal price to pay. Don’t get me wrong here, Hants, this axiom applies to both sides of the local political cesspool of complex wheeling and dealings. DAVID@ lets see all who speak from the chair and never looked for not one Plantation deed can say about this info i sent to BU. Its a start. Let us see if there is Fraud here also , cover and cover -Up? 3 pages http://www.plantation .bb info before the site was removed under pressure.FRAUD? 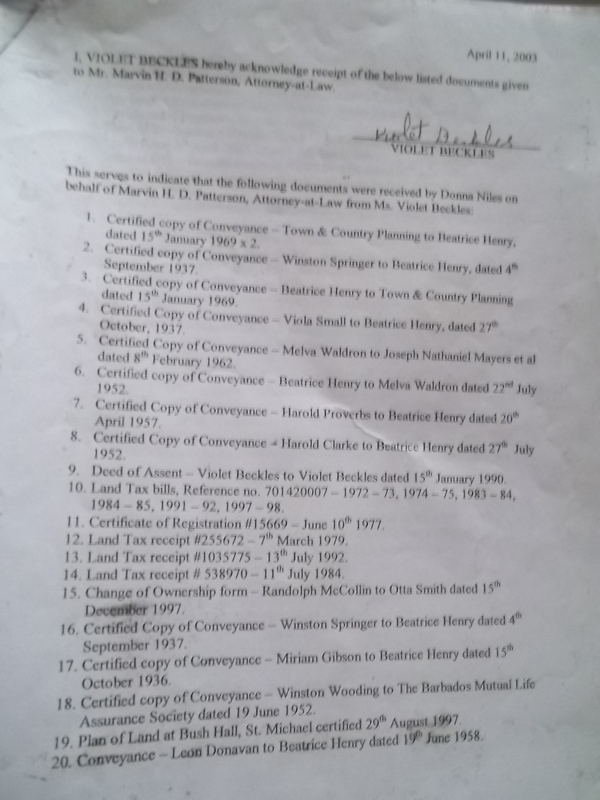 1 page 1913 Plantation Barbados google FRAUD? Now you all who want to talk can go see what you find At the Archives or Land Registry, see if this is a good Tilte or a CLEAR Tilte Deed for today owner in 2012 who may be looking to sell ?? Acknowledge receipt of your last email. It will be updated in the next updates. Remember to cut out the character assassination. Allow your documents to do the talking. To your earlier point. The tipping point is close at hand. 1. Prior to fusion of the legal profession in the 1970s there was no requirement that the attorney-at-law preparing a document sign his or her name as having drawn and prepared that document. 2. 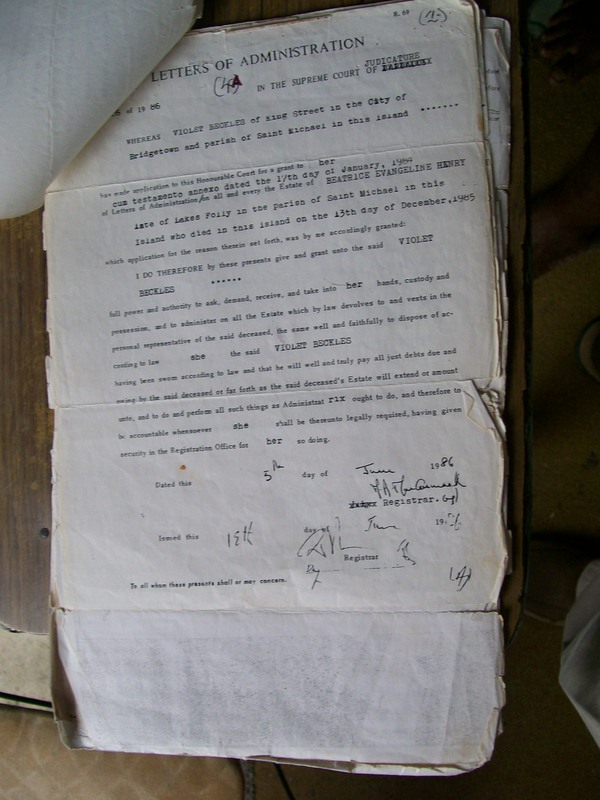 A deed drawn up in 1940 would not have required a declaration (see the last page of the document)by an attorney-at-law as to the nationality of either the vendor or the purchaser. This was a requirement of the Property Transfer Tax Act 1969. 3. There is no execution/signing of the Conveyance by the Vendor, Mr.Leslie Parris. 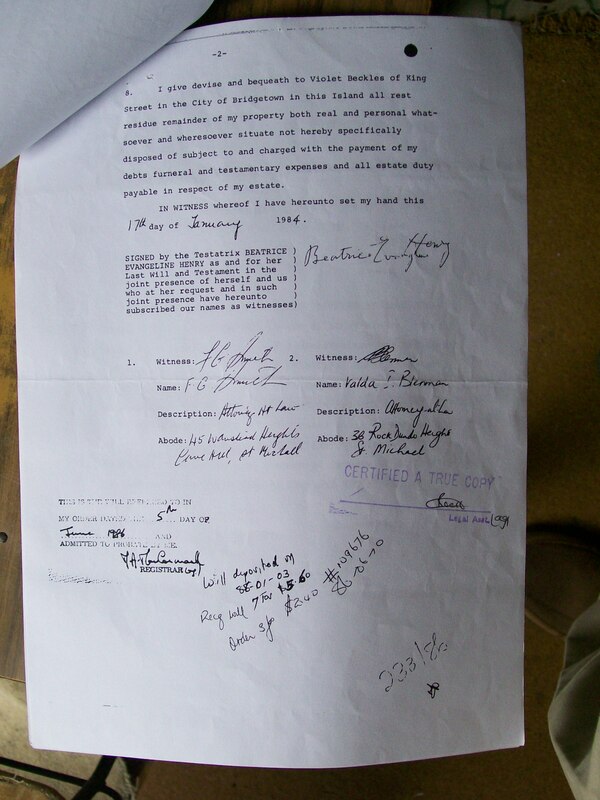 The document is instead signed by the Registrar of the Supreme Court who is not a party to the document. 4. I believe I am right in saying that Mr. Talma was not an attorney-at-law in 1940 and only became one when sometime in the late 1960s or early 1970s when some special allowance was given to him and Mr. Norman Niles. 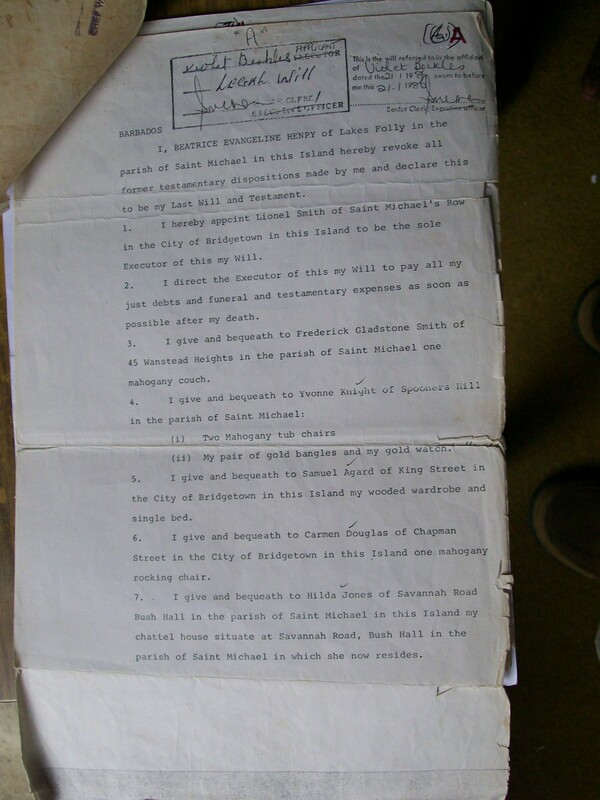 5.The probate under the signature of Eustace M. Shilstone, Commissioner of Probates, states that Mr. Freddie Clarke swore to the execution of the Conveyance by Beatrice Henry. 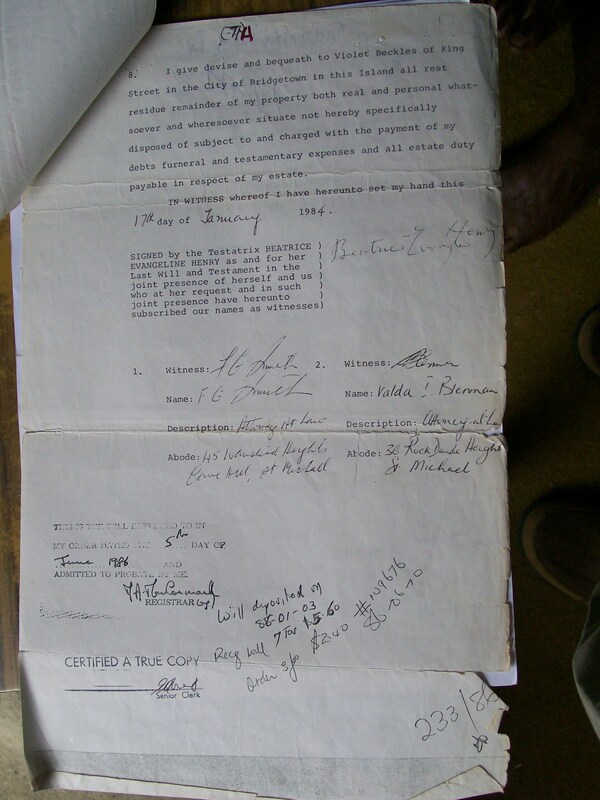 Her signature does not appear on the document and therefore could not have been witnessed by Mr. Clarke. Of course there is a very easy way to determine the validity of the document and that is by going to the Land Registry and viewing document No. 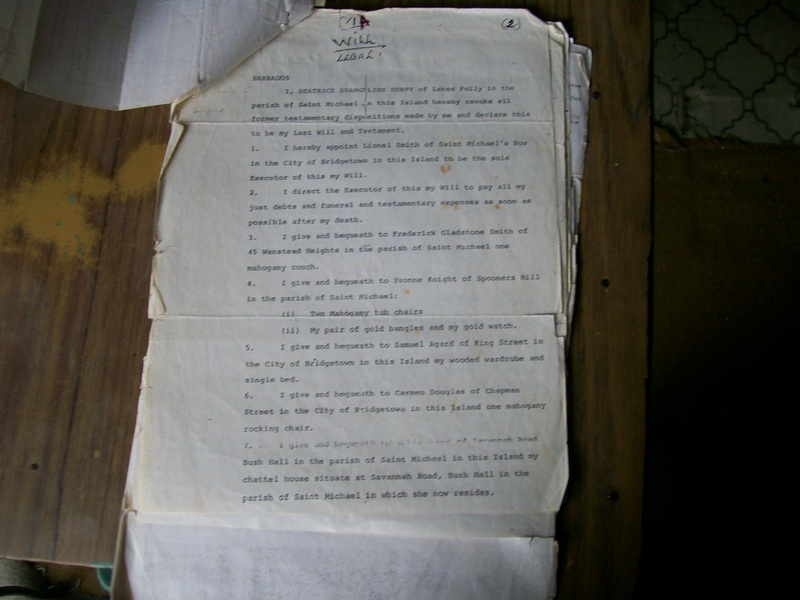 2220 of 1940 (see the top left side of page 1) which this document claims it is. Here is a simple question for the legal eagles: based on the documents which Deeds has produced so far are we prepared (by majority) say to BU stop exposing this matter on the blog? You note that even though there is an attestation clause, there is no signature of either of the parties. The document may be incomplete. You say that Mr Talma was not an attorney at law in 1940. But was anyone so styled? Note the drawn and prepared stamp. Unless Plantation Deeds is prepared to take court action, I think this most interesting debate has run its course. There is really nothing further that BU can practicably do. But waaaaaaaaaaaaait isn’t the said land at Waterhall Land being sold to tenants by said Leslie Parris or his heirs all now? What ever papers that was reproduced was not done so by Violet . The lawyers and the person at the Archives . The person still live in Barbados . A lot was done here and the Police need to keep looking and give a report. More than a year of looking and no one said its not true. The records from 1920 till now is still in the govt hands , We all need to see what is hidden , Some one knows what is what and will seek for truth. No one never said the information on the body of the papers were false .They just cant find no record for none of the plantations in the years of 1926 till now. Why ?we ask . 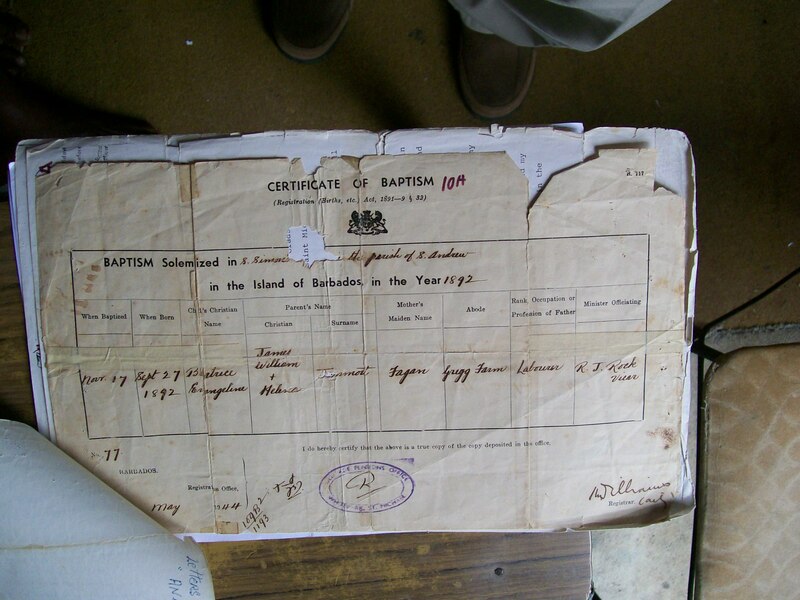 If any of BU legals eagles can find the Plantation Deeds that will be a good thing , for none else see to find what is part of Barbados History. David; Just casually looking through the documents (I’m no lawyer) and taking Jeff Cumberbatch and Caswell’s comments into consideration, It seems to me that “Plantation Deeds” probably has a case. But I think that it is quite likely that Beatrice Henry probably did not own, at her death, the number of plantations or parcels of land which “Plantation Deeds” appear to be claiming. I also think that, given the eminence of many of the persons that “plantation deeds” has mentioned in the matter, and given the general venality of Lawyers as a group, I think it is going to be well nigh impossible for him to win a case in the law courts here as every legal stratagem and technicality as well as other inducements (negative and positive) will be thrown in his way. He might however be able to prove his case in the court of public opinion. That is not likely to bear fruit in the very short run but I think it could be of serious value in the future if a reasonable third party gets into the fray in the elections after the 2013 one when everyone will be thoroughly disgusted with both of the current political parties and this case will feature as perhaps the most concrete example of the depths to which our legal system and some of its luminaries has sunk. So, to answer your question above. I, for one, think that you should allow and assist “deeds” to “Keep it coming”. Enuff@ that is true. We went to the UDC and no one showed a deed .But yet all others being paid . 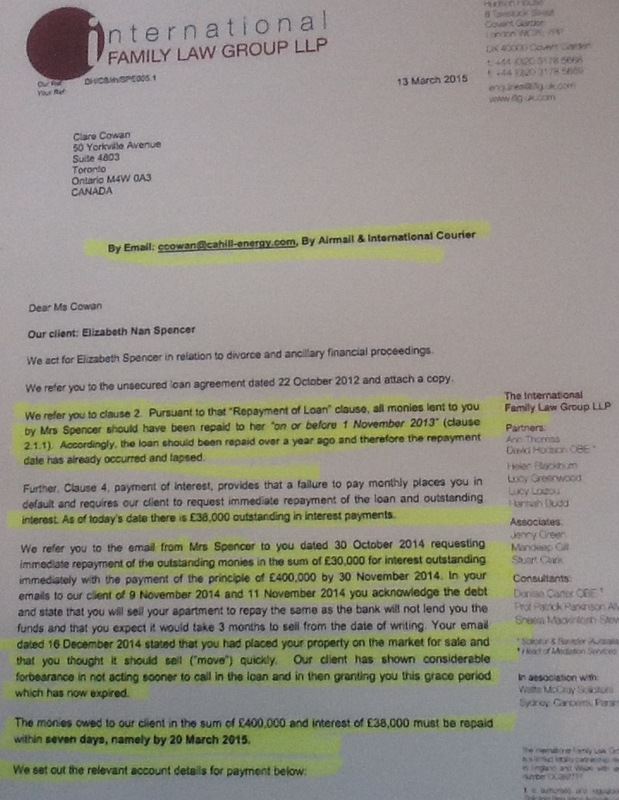 So Leslie Parris sold to Beatrice Henry, continued to collect rent then sold the lots to tenants? Agree. Allow for deeds to “keep it coming”. I think Deeds has a good case and has begun to ruffle feathers in government parties, the BLP and DLP. Recommend Deeds to post also on the Crooks and Liars site. . . . http://www.crooksandliars.com. The Violet Beckes story and documents that Deeds has in his/her posession should swim beyond the Barbados borders as did the disgust of Raul Garcia. The United Nations wants Garcia set free. United States Secretary of State, Hilary Clinton, additionally bashes Barbados (Bureau of Democracy, Human Rights & Labor – May 24, 2012) stating it is in violation of signed Humanitarian Rights Agreement. Checkit-Out@ We find land and houses bought and a few sold over a span of say 50 years , In searches . But we cant not find no PLANTATIONS MOVEMENT on the print outs. Plantations were moved but to where then . And if not Beatrice then why put her name on the papers. ?Violet worked with Mrs Henry she know what she had. Minister knows this from the Pine.Once again if some one out there know where to find the Plantation deeds that will be great. For they were sold but then to Who? Why not true why is everyone running? Jeff Cumberbatch@ can you find them? You may know some thing that we dont, We just want the truth. Deeds might have a good case but there is no one here goimg help him solve this puzzle>.the most it might garnish is continuing support for his effortbut at the end of the day it will be back to square one more questions and reccurring abswer,already i am feeling dizzy. Random thoughts we miss you where are YOU? Please come back to BU we need more sensible persons like you on BU. Pleeeze come back to BU. sniff sniff. Bonnie gone and didn’t even say goodbye…Bonnie eff yuh reading dis Pleeze come back to us at BU, we loves yuh! Scout are you still sulking? Man grow up and come back to BU. We miss you even though you are a sourpuss. Onions pleeze keep staying away, you haven’t been missed as yet so stay just where you are! Perlixing Pearlie…yuh still skiining yuh botsy at people? Be careful yuh might ketch cole in yuh poonkaloopsie! Tecchie ….you have been too silent are you alive? We miss you too. Therein lies a problem.Court action cost a fortune if you want a fair result. You need a “Top Gun” law firm if you hope for success. 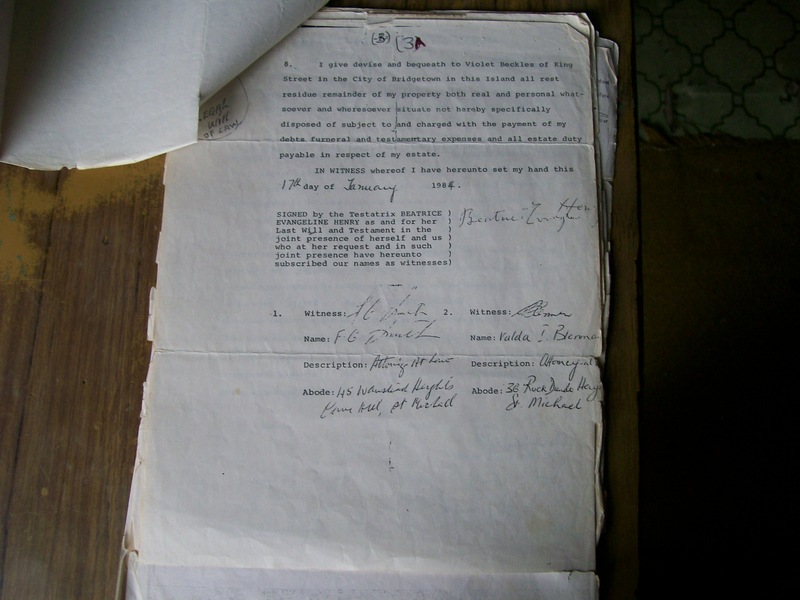 I have a hard time believing that all the documents produced by Deeds have no authenticity. Enuff@ YES they still getting rents. We met with Paris a very old man before he died and have him on tape some where i think?telling us to talk to his lawyer. Beatrice Henry, Nov 17- 1892 to Dec 13- 1985,, 93 years old..What did she do in her life time?, That it must be remove from the records of Barbados? 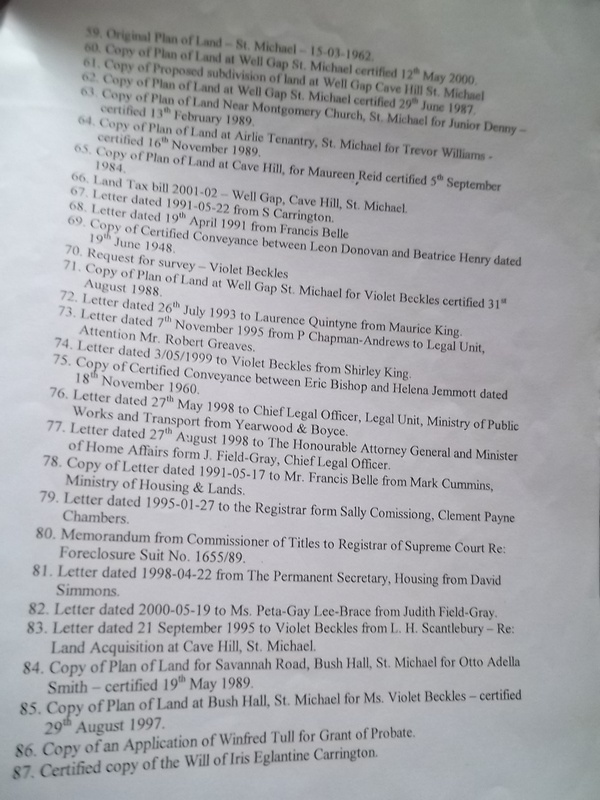 What ever she did she leave for Violet Beckles she also was removed for the Inland Rev, records . They Both lived and they both died. I would not trust another Barbados lawyer, also would not allow matter to be silent, continue what has already begun. People like Plantation Deeds are the ones that earn the Nobel Peace Prize. Dr. Martin Luther King, Jr. was awarded the Nobel Pearce Prize (1964); he demanded non-violent social change but wouldn’t keep his mouth shut. The Nobel Peace Prize you may or may not know comes with a large sum of money. United States President, Barack Obama recived the Nobel Peace Prize and 1.4 million dollars. An international lawyer, somewhere out there knowing this will rescue Deeds for the work already begun. Not much more is really needed to solve this puzzle and persecute those responsible. Liu Xiaobo is a Chinese literary critic, writer, professor, and human rights activist who called for political reforms and the end of communist single-party rule. He is currently incarcerated as a political prisoner in Jinzhou, Liaoning. China is not impressed that he is the 2010 Nobel Peace Prize winner. Barbados, likewise would not be impressed, Nobel Peace Prize awarded to Plantation Deeds. Never-the-less, a wrong has been done. Violet Beckles has right to Barbados history. Violet Beckles/heirs has right to what belongs to them. Speaking at a political meeting at the corner of Deacons Road, Owen Arthur said “the island had been humiliated by the recent S&P downgrade.”We have been reduced to junk status and someone has to be held responsible for it. He Arthur said also that the S&P downgrade report must be taken seriously. It perhaps never occurred to him (Owen Arthur) that Violet Beckles and now this Sherene Mongroo has been humiliated by theft [land, money, etc.] This must be taken seriously. Someone has to be held accountable. Prior to the fusion of the Legal Profession no deeds bore any statement as having been drawn and prepared by a solicitor the branch of the profession which dealt with conveyances and other land transactions. This requirement came after the fusion. You can check every conveyance prior to that date and you will find none bearing that statement. Ask yourself this how can a 1940 Coveyance make reference to The Property Transfer Tax Act of the year 1969 even citing it as Cap 84A when the Volumes of the Laws of Barbados in the form as we presently know them never existed in 1940. As I said before solve the matter by simply viewing the handwritten copy found in books either still at the land Registry or removed to the Archives. the outer rings of the deed , now study the body of the deed for the info. there are reasons why some things were done on reproduction by deeds by hand to give the info. The heading is also used when persons other than the first deed maker is redoing their work again,means different papers and different times who ever did it the 2nd time is also noted. I vote for this to to continue. I guarantee this is factual. Johnny has knowledge of the documents having seen and handled them. Where have they disappeared to. I myself am personally living the said nightmare. Ask the Marshalls and Paynes of the Roebuck Street Law firm. What about all those documents which went missing when the documents were being transferred from the old registration department/Court to the New Halls Of Justice. How convenient….. What about the thousands of complaints at the Bar Association regarding illegal property transfers by top attorneys who of course also happen to be well known or should I say notorious politicians in this island and of course members of the Present Opposition Party. Only in Barbados….. and only to us Barbadians alike the relatives of our dearly beloved Violet Beckles who would have fought to make a way for us. It is high time that these perpetrators be brought to Justice. It’s a sad that my Grandmom Ermie is not here to testify on the behalf of Violet Beckles. Keep on Fighting Plantation Deeds…. My LOGICAL assessment of the ” information ” produced in respect of this saga , which provides more questions than answers , is that our system of land transfer is being unjustifiably slandered ; it is just not easy to steal land in Barbados . It is possible for persons to surreptitiously occupy land and then seek to apply for a title through prescription , ( long uninterrupted occupation without the use of force , stealth or entreaty ) but that is a very longwinded , transparent process . I have also been aware of the publicised ,enthusiastic attack a number of young lawyers made some time ago to solve this matter once and for all and enable Violet Beckles to finally inherit what was being claimed to be her just entitlements . Those young zealots soon found themselves in the same position which their predecessors of every rank encountered ; the evidence produced by documents , together with the instructions provided by Mrs Beckles and her advisor Ivan Lynton lead them nowhere ; they had to do what all others before them did ..abandon the effort . So Mr Miller I do not think it is justifiable to blame anybody whether in a professional or political capacity for his failure to perform some of the tasks that may only be accomplished by a HOUDINI . I am not aware that our justice system has any of these persons within it . I hope I have disabused your mind of any misconceptions that might have been lurking . Now we’re an inch further. Did these “eager” or enthusiastic lawyers of whom you speak make any determination of the facts of the case? Did they come to any hard conclusions? Did the case just peter out by either attrition or by the reaction of the legal people who were involved in the case earlier? Did they get full support from the lawyers mentioned by “deeds”? You really need to tell us some more for us to disabuse our minds from any misconceptions? Can you name one young lawyer who was involved in the effort to get to the bottom of this tangled weave? Who caused the tangling? Violet Beckles? Her many lawyers? The system? This thing does not seem to be going away and your letter above is not clarifying matters, it only adds to the intrigue. But as deeds says; We know so little of two women who appear to have been role models in terms of being examples of black entrepreneurs who should have been rich but who the system seems to have made invisible. Did your young turk lawyers speak to that in their effort? Legalese; To my mind you come over as an apologist, at best, but possibly much worse at worst. Is this not a matter ripe with issues which young and bright minds maybe challenged to build a case study at Cave Hill with a concise and relevant brief from you? What is the point of laws if it is not perceived to deliver justice. Deeds has sent a few more documents but BU has decided to give this issue some ‘breathing’ space. As ac stated there is a lot of information to absorb. I agree that this would prove a most interesting case study for the training of young Barbadian attorneys in Conveyancing practice. However, that is not the remit of the Faculty of Law, Cave Hill but rather the Hugh Wooding Law School. I am not sufficiently informed to argue with Anon about when drawn and prepared stamps first appeared on local conveyances, but I think that the mention in the deed of a statute passed nearly a quarter of a century later does not speak to an attempt at deceit. That would be much too obvious an error. 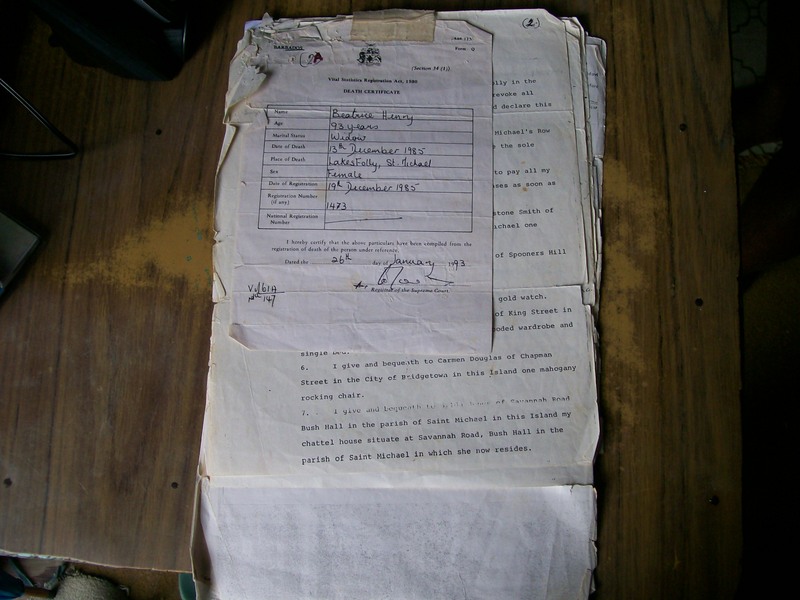 It shows rather that the document was a crude attempt at the reproduction of a (lost?destroyed?) original. But I think that the lay persons on the blog missed the essential point that I made yesterday to the effect that the ownership of property is a legal and not a moral construct. The only way in which the heirs of Ms Beckles may gain title to any of the claimed property is in accordance with legal principles and provisions, not the views of bloggers that “some lawyer musee tief her land”. I see that you have reached out to this blog audience for help [December 20, 2012, 5:53pm]. You do indeed need help. You need a lawyer, a damn good one, an international one. Do not settle for anything less. You have in your posession, dynamite a lot of it. It can and will hurt a lot of those made prominent in Barbados. You, additionally need to continue exposing your documents but do you not realize that some of those lawyers you have exposed enters or may have entered this blog? You are reaching out to them for help but they are your adversaries and will not help you. Miller, a regular on this site may even be Cheltenham. Mr. Cheltenham, you may or may not know is linked to McGill University [Montreal Quebec, Canada] has/had knowledge of the Quebec, Canada language [French-Canadian]. Miller is also linked to the Quebec, Canada, area has knowledge of that language [French-Canadian]. Those lawyers, politicians, etc. do you not know [figuratively] sleep together. Bajans, at moment owe Al Barrack millions. Al Barrack has in his possession a court ordered judgment. Bajans must pay. George Payne, though, is slated ten million and Dale Marshall two million. Owen Arthur, Mia Mottley and Dale Marshall awarded Barrack a government contract, without tender. Barack built the complex at Warrens in St. Michael but had no record of building a project that size. All were [figuratively] sleeping together: Owen Arthur, Mia Mottley, Dale Marshall, George Payne and Al Barrack. What a laugh! Owen Arthur, Mia Mottley and Dale Marshall awarded VECO (Alaska) a government contract, without tender. VECO built the prison at Dodds in St. Philip but had no record of building prisons. All were [figuratively] sleeping together, Owen Arthur, Mia Mottley, Dale Marshall and VECO executives. What a laugh! The point is well taken about the legal and not moral constructs and the implied mutual exclusiveness of those terms. But perhaps the moral side might be attacked at the same time as the legal side (In fact I wonder if that is what “deeds” is attempting to do now). In any case, I wonder if some trainee lawyers at the Law School, in their course on conveyancing or whatever, could be assigned the task of tracing back the ownership (deeds etc.) of the 17 properties that Caswell alluded to in his report, as a starting point? 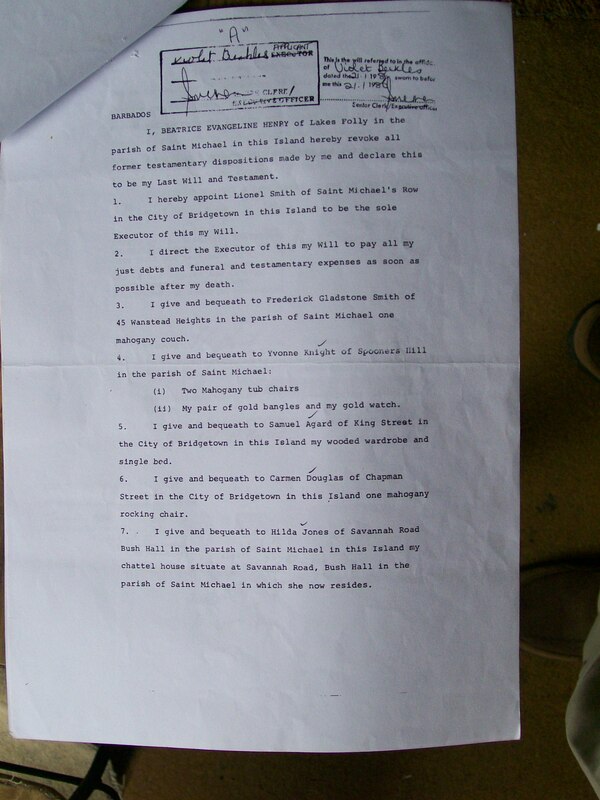 (with Barbadian or other Students taking up a project with the research being done here but under instructions and the remit of the the Sir Hugh Gooding Law School, but not anyone or any agency in Barbados) and that another aspect of the project could be to correlate the findings and see where they severally led to in terms of ownership, times of transfer, Solicitors or Attorneys involved, lost files, etc., relating to the 17 Caswell cases. This might give us some idea of interlinkages. The other thing in this matter which I think is sorely needed is a historical treatment of first Beatrice Henry and then Violet Beckles. There seems to be so little known of them that it seems passing strange, especially for persons who obviously had access to very large sums of money even while living in apparently less than ideal circumstance, that no one seems to have done the research that could bring the individuals and their life and family connections to the fore. It seems to be a story that needs to be told for posterity and for our youth to have some idea that some people from those times achieved. This whole thing is crying out for an Historical and social approach that could tell us a lot about the Barbados I live and lived in and did not know existed. These ladies are extremely important historical figures. We all understand that this matter must be argued in a court of law (if Deeds goes that route) using all the good principles to which you referred but what is justice? As members of civil society we are ALL responsible for seeking justice. Very interesting ! But “Deeds” has backed up his assertions with copies of documents. It would be very helpful if you would do the same re Barack. Re. the linkage you try to draw between Cheltenham and Miller, It seems too tenuous to me to be even considered. Indeed, looking at your points, you would also have proven that I am Miller too as I was also a student at McGill University many years ago and there are many other ex McGill students who now reside in Barbados and who may well be frequenters of Barbados Underground. However, let me add that I am definitely not Johnny Cheltnham..
One of Errol Barrow’s famous quotes is “If you are seeking justice don’t go to our law courts”. Even though he was a lawyer himself he was particularly harsh on them as a group. Errol Barrow should also have said that if you are seeking openness stay to f#ck away from Political Parties … David, republish the damn video nah .. Someone here getting touchy about attacking their preferred political party FRIENDS hummmmmmmmm (BAFBFP). anonymous, I like you, always have. Don’t go and spoil it now … The reason I sayin’ dah is because you could be anybody. Why would Beatrice Henry convey land to the Town & Country and vice versa in 1969? It seems that your acquaintance with Mc Gill did nothing to improve your capacity to be illogical and personal . You call me some sort of an apologist but fail to raise one logical counter to anything i have said on this matter . You now call for historical and sociological research . Now pray tell me ..would it be at all logical for a woman who ” bought between 200 to 300 plantations in Barbados between 1928 and 1978 ” to remain unknown ? she would have to be a David Copperfield to achieve that feat and remain an unknown , untraceable in our social history . This claim IS JUST NOT CREDIBLE . You may continue in your quest trying to make sense out of historical nonsense by engaging in the favourite pastime of trying to smear persons in the legal profession . Legalese@ That is why its call fraud.its not call truth. I hope that BU save all the good and bad words at this issue , For one day we all will have to bow down to the Queens of Barbados. This Fraud in the end you will see the same names over and over again , No Matter the Island nation. UDC was ran by lawyers and all other must shut up and take it. As long as a lwyer was dealing with you dealing at UDC not more matter , UDC set up to launder land and to get paid out check with no proof of land with a deed. 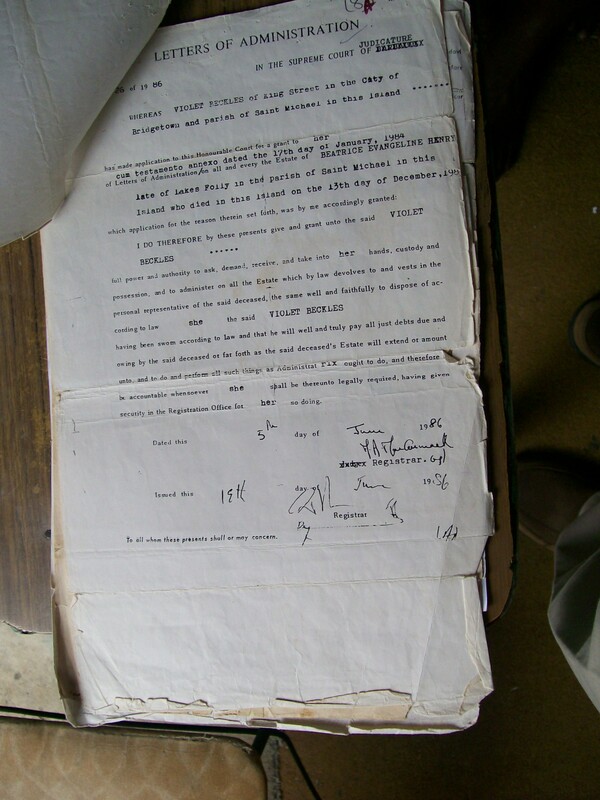 We saw at that point no deeds for payment just letters from lawyer stating a deed . Sorry to have misled you. I really went school at Brumley here and only passed through McGill but not long enough to be imbued with the depth of logic and learning which you’ve exhibited on this thread. So please excuse my illogic. Your superior logic depends on taking “deeds” statement about 200 to 300 plantations literally and ignoring totally the weight of the documents etc., which he has brought to the table. I prefer to consider that he probably misspoke on the plantation numbers and was referring to parcels rather than plantations as I know that it would have been quite incredible for Beatrice Henry to have owned 200 plantations in Barbados at that time while remaining unknown. But you appear to refuse to consider that even owning 17 large parcels of land in the city and elsewhere, as verified by Caswell and apparently accepted by Jeff Cumberbatch, should also have made her a citizen of substance who really should have been captured somewhere in our history. Of course, her apparent lifestyle did not appear to suggest this and I thought that It might be of some historical value to research the life and times of the woman and clarify the apparent inconsistencies. You prefer to jump on the 200 plantations gaffe to throw out the whole case in the time honoured tradition of the legal profession. I’m sorry if I appear to be engaging in any smear campaign against the legal profession. I thought my contributions that might be arguably labelled as such were actually fair comment in that I didn’t invent the numerous cases of Lawyers being sued by numerous overseas clients for malpractice or misfeance and that if you are fair, there have been quite a few cases over the past few years which paint several members of the legal profession in a light that is far from honourable. The “favourite” pastime is therefore quite logical. Y ou were right in that some aspect of my post could arguably be considered personal and I apologize if I have unwittingly stepped on a corn somewhere. I’ll try to continue the quest leaving out the comments that might be deemed as personal (against an unknown lawyer) or gratuitous. BUGGS BUNNY@ Well there is more than one lawyer on this site and most seem to want to run the site as they run the people minds. We can show many papers and proof as we see as some thing is wrong , They then after 99 parts to a paper and look for a verb to dismiss all other 99. Always looking for a way out, not to get some thing done, A good book to get is a Black Law Dictionary . Many say they love God but yet spell it wrong , But the” GOD” in the court room or the” god”in your Home or heart is not the same “God” We deal with. This info is for all, even the crooks lawyer that cant fool Me With street law . As Mia said there are 20,000 open lots , Keep in mind they cut up Plantations and is ready to have a feeding by selling them off as their own land for gain.ALL LAND have an owner.Why in Barbados no one Govt or Persons know who owns what after 1926 .?? This is the Fraud the Massive Fraud, All land can be traced back to a Plantation deed just like your DNA, if there is a GAP in title or DNA you are DEAD. Once again at any time any place We will show up and give a full 360 on any question dealing with the Fraud that we see, One nor 2 persons can talk this away with out showing Us Paper better than what we have. This is the start of Freedom Of Information Law not the Act they looking to pass. For not they have to show what they have to confront what we have , Just because they may be a Judge or QC they cant talk away what we have and know. If Sir COW and Sir HAM is ready , they have my phone number and know where i live. Remember the same lawyers are now judges today in the High Court, So you will see the same crook judge dealing with the same smelly cases, They have to cover their tracks and others in the pool of mess. 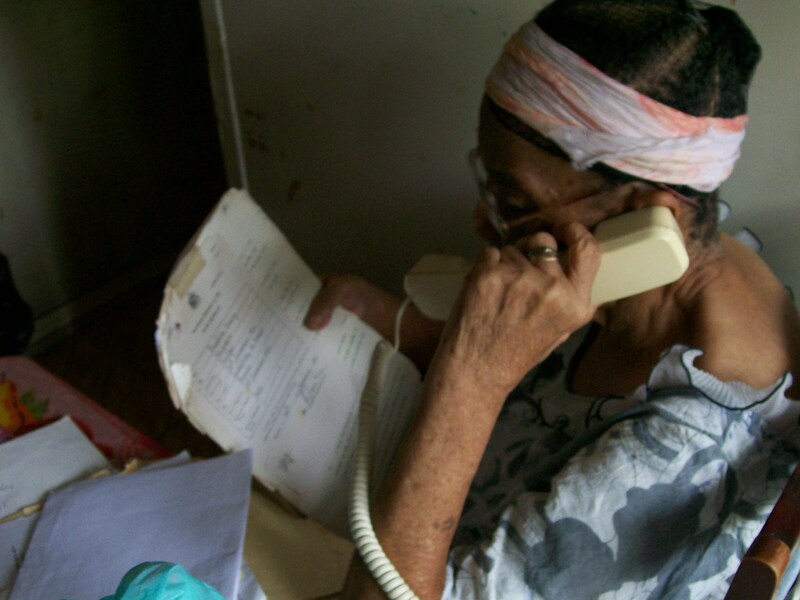 There are no Title Companies in Barbados to back up the deeds or selling of any thing , Most cases the same lawyer is on both sides of selling and buying ,Not a good Practice. Remember you will see the same crooks and PONZI Fraud all in the Caribbean being done buy the same group of Persons , Lawyers and Banks, We have 4+2 bases of of looking for deeds owners. Plantations.bb, 1913 Plantations. 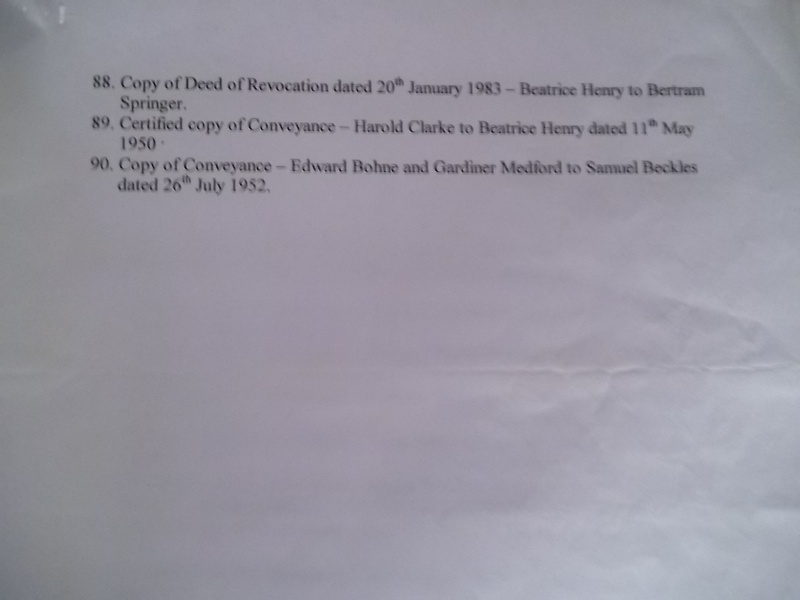 1920 Book,The Deeds ,+Beatrice Henry 93 Violet Beckles 92.Ask the Police or the AG what they doing? I invite you to read the several post I have placed on this matter and consider if the only questionable aspects I have raised . After you have faithfully considered what I have posted then we may probably continue the discourse . Agree, there is more than one lawyer on this site assuming authority. Some are not quite ripe for practicing law and certainly not capable of challenging your case. I have the Black Law Dictionary and know law. Enuff @ I will stop when the truth is told. UDC always asked who was your lawyer? As you may not know many or none had deeds , So all relied on the lawyer paper work , As Telma was told , YOUR NOT AT LAWYER , AND SO ON , If you think the meetings was easy think again at the UDC , We have meetings also ,What was said in the meeting and agreed upon was never done. All check issued was to go to Violet , never happen they were Issue to Richard Byer instead. When a lawyer get a check in his hand for you most dont see the money. YES , Byer got rents also and never past the money to Violet . Yes We have proof . If you think UDC ran easy and true , ASK why so many was moved form the top down to many time ,,, Check your old news papers.We will see what i have. When we went to the AG , We were told to go here , go there and all over the place ,We never move from the seat or we showed all the places we went , They then said YOU did a lot of work ,, I said that is where we are here NOW. The took out paper but never move a finger. But Black’s Law Dictionary is an American dictionary of legal words and phrases, not a law text. 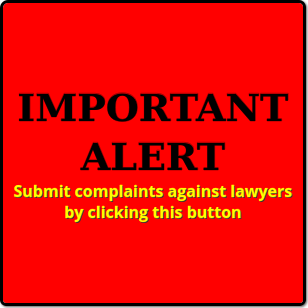 More than one lawyer frequently visiting this site, some are possibly the very ones that you have exposed, want to see what you have presented and comments from audience. You need a lawyer, a damn good one, an international lawyer. The United States foreign exchange student, Amanda Knox in Italy was persecuted and convicted. Her conviction was appealed and over turned. Her family somehow found an international lawyer, a damn good one. Do not trust lawyers on this site; all are likely Bajan and some of the ones you have exposed. 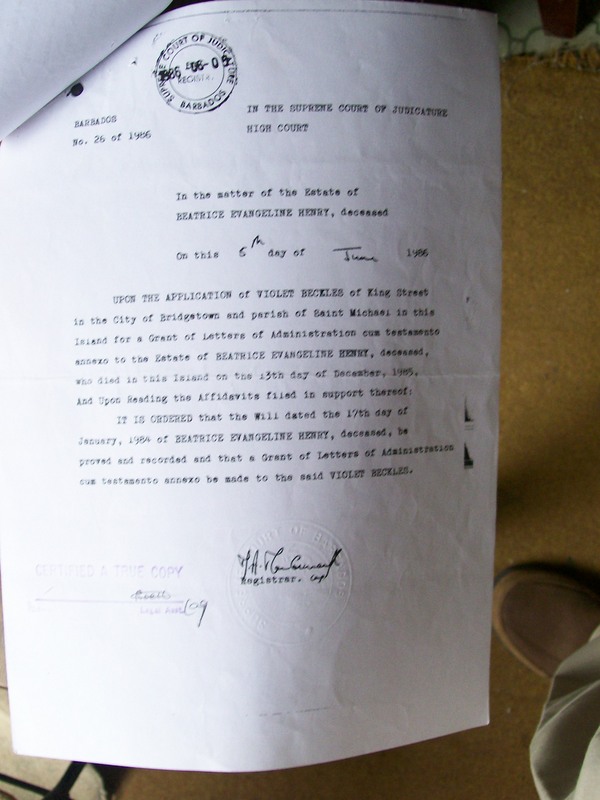 DID any of the lawyers and legal Persons out there in BU land look for a Plantation deed as yet ? How About FARM plantation ? All need to be in the 6 ring binder at the Archives? Noted by http://www.plantations.bb Heading . LOOK @ When i was called to look in to this Mess at the time 270,000 Baians and 45,000 that stayed past their Visit on this Island. Only One lawyer , One Senator , One Minister See some thing wrong in all of this and I must me the next Fool for them . and signed twice by who is alive each NOTE.PRINTED. If the lawyers did this in American what would happen ? If the lawyers did this in England what would happen ? What make Barbados so Different and then to be called Little England? Where the hell is the Queen and the GG in all of this Wrong doing? Beatrice Henry loved Barbados and her People, Ask Hammy who made the PINE possible . She bought from the WHITES and gave to the POOR. We have a Deed for the PINE 410 acres. I know and can tell you for certain that the United States and The IRS (Uncle Sam) in it [United States] will HAVE NO MERCY on them. Bajan man Victor Bourne will certainly concur. Victor Bourne, a bajan in the United States was convicted of drug trafficking from the Caribbean into the United States, that and money laundering. The investigation that concluded culminated in Bourne’s conviction and sentence has resulted in 20 convictions, including the conviction of 19 American Airline employees, the seizure of 13 kilograms of cocaine and 2,900 pounds of marijuana, and the forfeiture of US$6.9 million. Bin Laden hurt and humiliated the United States when he destroyed those two World Trade Center Towers. He took the lives of many ON AMERICAN SOIL. The United States took his life, Bin Laden. It [United States] had NO MERCY. United States Secretary of State Hillary Rodham Clinton in October 2009 faced sharp rebukes from Pakistani audiences. . . . who accused the U.S. of conducting “executions without trial” in aerial drone strikes. Slapping back, Clinton questioned Pakistan’s commitment to fighting terrorists. “Somebody, somewhere in Pakistan must know where these people are,” Clinton said in an exchange almost as blunt as her exasperated comments a day earlier that Pakistani officials lacked the will to target al-Qaida. In April 2011, President Barack Obama ordered a covert operation to kill or capture bin Laden and on May 2, 2011, the White House announced that U.S. Navy SEALs had carried it out, killing him in his Abbottabad compound in Pakistan. On 08/31/2006 United States FBI and IRS Officials raided the offices of several prominent members of the Alaskian Legislation. The investigation involved allegation of illegal gifts to lawmakers from the VECO Corporation home based in Alaska. One of them, Senator Ted Stevens was indicted by a federal grand jury on July 29, 2008 on seven counts of alleging that Stevens received from VECO hundreds of thousands of dollars in gifts that he did not declare on his US Senate financial disclosure forms. Stevens was convicted on all seven of these charges on October 28, 2008. All convictions were later vacated. Another, Don Young was under federal investigation for possibly taking bribes, illegal gratuities or unreported gifts from the VECO Corporation. Between 1996 and 2006, Young received $157,000 from VECO employees and its political action committee. Also, the Alaska State House of Representatives Pete Kott, Bruce Weyhrauch and Vic Kohring were all charged with federal crimes as part of the investigation into VECO. Senator Ted Stevens (Alaska) BEFORE persecuted and convicted by the United States had received 250,000 home renovations of which included a $5,000 generator also a Land Rover (SUV) worth $44,000. VECO (Alaska) was major contributor to political campaigns and one of Senator Ted Stevens’ biggest campaign contributors. Congressman, Don Young (Alaska) between 1996 and 2006 BEFORE persecuted and convicted by the United States received $157,000 from VECO employees and its political action committee. Owen Arthur, Mia Mottley and Dale Marshall gave to VECO a government contract WITHOUT TENDER. VECO built the prison at Dodds in St. Philip but had no record of building prisons. Certainly, VECO gave to them, Owen Arthur, Mia Mottley and Dale Marshall something for such generosity. Money? Gifts? Political Contributions? Now, now VECO was an United States Corporation, home based in Alaska. As of this date, VECO ceased to exist not the FBI and or IRS. The FBI and IRS during investigation confiscated all VECO records, has knowledge of all its business operations involving Owen Arthur, Mia Mottley and Dale Marshall, etc. in Barbados; they [Arthur, Mottley & Marshall] nor the DLP can hide or cover-up this up. David Thompson made no effort to pursue the VECO matter or those he knew were involved because he himself got a piece of the VECO pie. Maybe. The IRS and FBI in the United States seized millions of VECO records. Those records show payments and gifts surrendered to Owen Arthur, Mia Mottley, Dale Marshall and David Thompson. Maybe. Both the BLP and DLP had some of the CLICO pie. The DLP though had an awful lot more. Owen Arthur invited the 75,000 campaign cheque into his personal banking account knowing it did not belong to him. David Thompson made no effort to convict him. Owen Arthur, he knew was a dishonest man but he (David Thompson) knew that he himself was a dishonest man. What you do in darkness will come to light” (New Testament/I Corinthians 4:5). Barbados according to the United Nations has lots of theft. There are perhaps pointing fingers at those corrupt laws and certainly those corrupt politicians: Owen Arthur, Mia Mottley, Dale Marshall and David Thompson. Lots of theft, quite obvious and applicable to CLICO, VECO, and certainly Violet Beckles. Where is it written that the parties you names received gifts from VECO? You have 10 minutes to provide a link. The DLP is perhaps making effort to cover-up Owen and Mia also Dale because it also has to cover-up David Thompson. All were [figuratively] sleeping together. Birds of a feather flock together as does corrupt lawyers, judges and politicians. Sorry BAFBFP, all are/were politicians, Owen Arthur, Mia Mottley, Dale Marshall and David Thompson. David Thompson and the DLP in 2008 humiliated Owen Arthur’s regime of fourteen years. This case, Violet Beckles humiliates it more. What you read apparently is confusing. The posting says VECO gave to them something for such generosity. Money? Gifts? Political Contributions? The posting asked questions not making statement that they did indeed received money, gifts, political contributions. Continue to comment on this topic HERE.